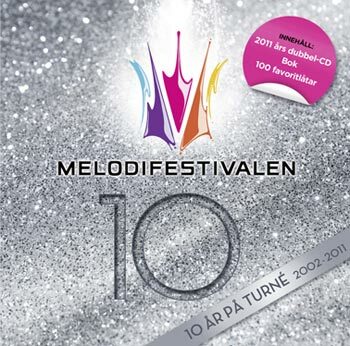 This year Melodifestivalen celebrates 10 years since currently acting system of semifinals (a bit modificated now) was introduced back in 2002. Great way is to make it memorable with release of new schlager-collection. And we get it on March 4th! And even two versions! 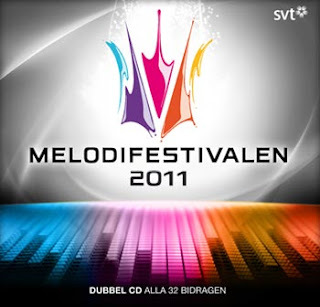 Well, sure you will be able to buy standard double disc of Melodifestivalen-2011, you can watch newly presented cover above. What do you think? And also you can get a silver pack with MF-2011 disc, 80-pages fan-book with some interesting stuff collected by Christer Björkman and compilation of 100 favorite songs on 4 discs and golden pack with MF-2011 disc, book, compilation on "superjewel" CDs and disc containing songs versions you never heard. Exciting? I just can't wait to put my hands on a golden pack! How great would it be to get some initial demos performed by different but beloved artists like Sonja Alden singing "Invincible" and Daniel Mitsogiannis singing "Cara Mia". But now we can only guess what will be there and as soon as we know we'll tell you! Thanx for the tips to Pierre's Schlager Experience. Piotr Nikolaievitch, people give good responses to http://www.nordicmusik.com/ and they always have Melodifestivalen-related stuff and deliver it everywhere. I didn't try to buy there something but you can, just check and I'm sure these discs will appear there soon. I'm going to buy MF gold pocket from nordicmusik.A very good and cheap store in my opinion.I'm interested in the cost of this pocket.What do you think how much it can cost? Maybe anyone knows when Linda Pritchard's album is going to be released? At ginza.se golden one's price is 549 kr. Rise Again,Glorious,You're making me....,Alive,Fast Car,Not Even Hello & Miracle. It's interesting how many tracks will be on the album and what will be the name of the album? Nothing's solved about it but I really-really hope that we'll get much more than 7 tracks :) At least not less than 12!